A session was held for the first year students of PGDM (IB) and PGDM (RM) on 15th Dec, ‘2017 on the Challenges and Opportunities of Entrepreneurship. 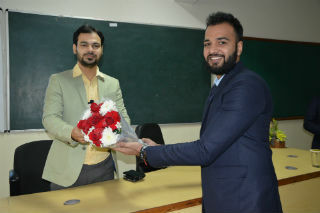 It was conducted by an entrepreneur Mr. Gaurav Vashisht, who kept the students involved through stories and real life instances of several successful start-up ventures. 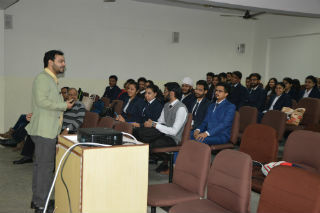 Earlier, the session began with a welcome and brief introduction of the speaker by Mr. Vikas Yadav, student coordinator for the E-Cell club. 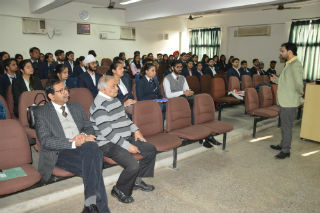 In his highly engaging address, Mr. Vashisht generated curiosity and interest among the students on the opportunities offered by the Start-ups. 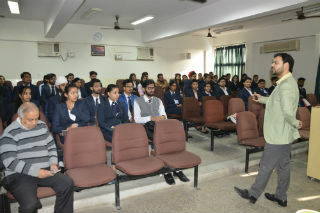 Several students raised their queries and took advice of the speaker on their business ideas. Session ended with a vote of thanks by Dr.Sumesh Raizada, faculty coordinator for the event.